We’ve talked a lot about navigation these past few months in our Part 1, Part 2 and Part 3 blog articles. 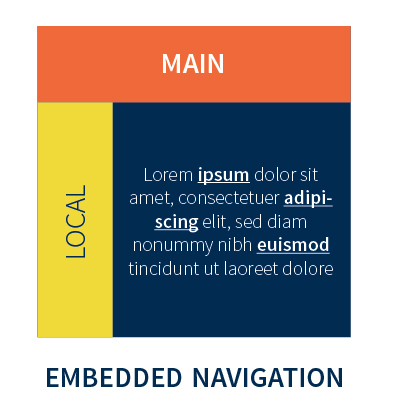 This month we are diving deeper into another topic and discussing alternative navigation. Most people misunderstand the terminology of alternative navigation, but it is actually a common type of navigation found among most of your online surfing. Have you ever been on a blog article that shows “related content” at the bottom or on the side of the page? Or come across links applied to a word or phrase right in the middle of a sentence? If your answer to either question is yes, then you’ve likely used alternative navigation before. This type of navigation is important for citing information, improving your SEO ranking, and backlinking to connected sources. As shown in the graphic below, this type of alternative navigation is placed within the text itself. An example of embedded navigation is right here in this sentence. Benefits: This is great to use if you’re referencing another webpage, whether it’s citing a source for a statistic or linking to related information, embedded links are a great quick solution. Challenges: Embedded navigation can sometimes confuse users when not properly communicated where the links go. For example, you don’t want to say you’re linking to your company’s Facebook Page, when you’re really linking to a landing page on your website about Facebook. It’s misleading and can frustrate the user. Best Practice: It’s a good rule of thumb to have all outside links (to other websites) open in a new tab so you’re not directing the user away from your site completely. This navigation is often represented as plain text links and appears at the end or to the side of the content, refer to graphic below. Benefits: Related links tend to be very user-friendly, especially on news sites or news/blog sections of a website. 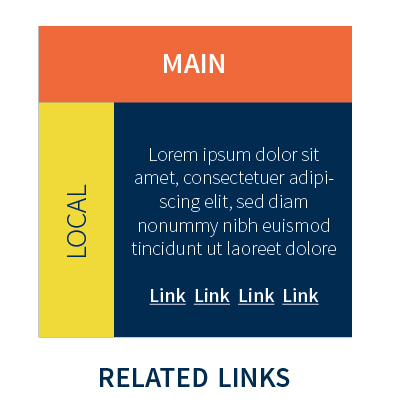 Typically, the association of related links notifies the user that the links will take them to information that is connected to the content they just read. Challenges: Related links sometimes can go unnoticed since they are outside of the primary content area. Additionally, it’s important to make sure these pieces of content are actually related to the page’s content to avoid misleading readers. Best Practice: As noted above with embedded navigation, it’s recommended to have all outside links (to other websites) open in a new tab so you’re not directing the user away from your website. Quick links generally appear at the top of the page as their own component or on the sides of pages as a dropdown or dynamic menu. 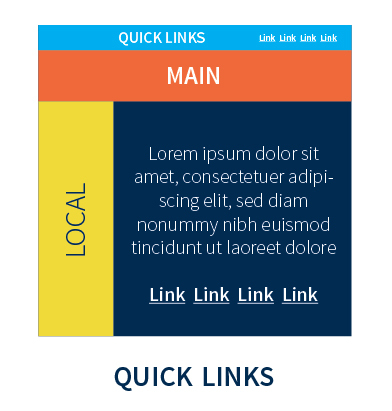 Although similar to embedded and related links, quick links are related links from the entire site, not just a given page, usually highlighting frequently accessed content, but may promote pages further into the site. See below for a visual representation. Benefits: Quick links can make the site less cluttered by organizing several links in one area (at the top of the page or a side menu). Challenges: Since these are used for specific pages or categories, this may make it hard for users to find this link from the regular navigation, forcing them to find the page they are looking for through the page they originally found it on. Best Practice: Quick links should always be structured based on hierarchy, have them appear in order of importance as it relates to your website. The first thing to think about is the content of the page. What is this page about? What information are users seeking from this page? Commonly, alternative navigation is used for connected or related resources, but shouldn’t be used for important pages on your site. So, how do we distinguish and select the right navigation? You can read more about the many types of navigation in our Navigation in 2018, What’s the Right Direction? article. Backlinking is basically the linking from your website to another, or from an external source to your site. Linking is fundamental towards improving your Search Engine Optimization (SEO). By the way, this link we just used is an example of an internal link since it’s an article on our website, and isn’t inbounding to another domain. But, why should you use external links? External linking is about reputation, credibility, and worthiness of the source. Information from reputable sources should always be cited; it’s important for websites to exchange information and link amongst each other. The goal is to build a network of backlinks not only among your site, but other highly ranked sites. Building backlinks with external sources is normally accomplished through forums, comment sections, and other types of communities. If you need assistance with alternative navigation, backlinking, or strategically planning content on your website, give us a call at 248-687-7888 or email us at inquiry@mediag.com. We can help improve your website with implementing the correct navigation, and in turn improving user experience and your search engine ranking!